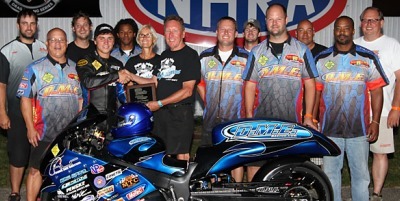 DME Racing’s Dimey Eddinger knows what it takes to win heads-up, no wheelie bar racing. 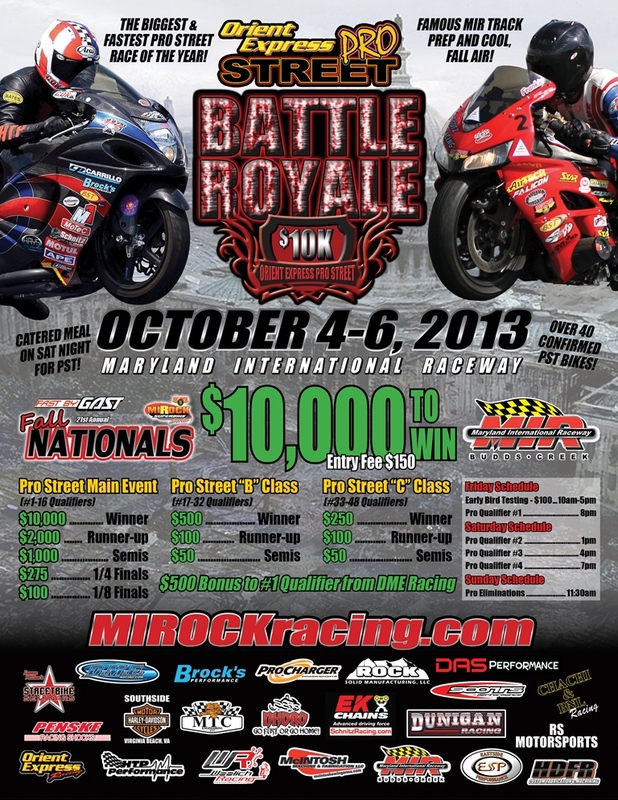 Eddinger is calling on his many years of experience to prepare his team for victory at what he believes will be the biggest Pro Street race in history, the Orient Express Battle Royale at Maryland International Raceway, October 4-5. The winner will receive $10,000 – an unprecedented purse for the class. Perhaps living just five miles from revered NASCAR powerhouse, Richard Childress Racing, has helped inspire and condition him. The successful, Winston-Salem, N.C. business owner has been involved in the sport for nearly his entire life and has been a fixture in MIROCK since the series’ inception. Eddinger manages a three-rider team which consists of Joey Gladstone (best run -6.95, ranked 4th in the world) , Terence Angela (7.03, 8th) and Jason Dunnigan (7.11, 15th). 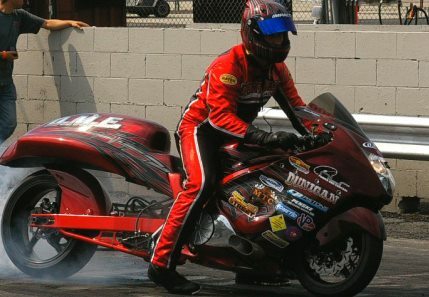 Eddinger retired from riding at the end of the 2011 season to put more time into running his business and guiding his team. His personal best in MIROCK is a 7.16 – a number that still has him ranked in the top-25 worldwide. Eddinger’s experience and preperation could very well lead his team to a $10,000 payday on Oct. 5th. For more visit DME on the web.